If you’re currently planning what to do on your honeymoon in Bali, look no further. The island of the Gods is an increasingly popular honeymoon destination for all kinds of travelers – why? Because it’s the perfect getaway! With exciting adventures to be had, romantic sunsets to be watched and luxurious villas to be filled, there’s no excuse for choosing anywhere else to enjoy your time as newlyweds. We’ve thought outside the box to put together this list of romantic yet unique tips for getting the most out of your time together in Bali. Start planning your honeymoon now – you won’t be disappointed! For more adventurous couples, a visit to Jembong waterfall is an exciting way to spend a day – this glistening wall of water is still relatively unknown to tourists. 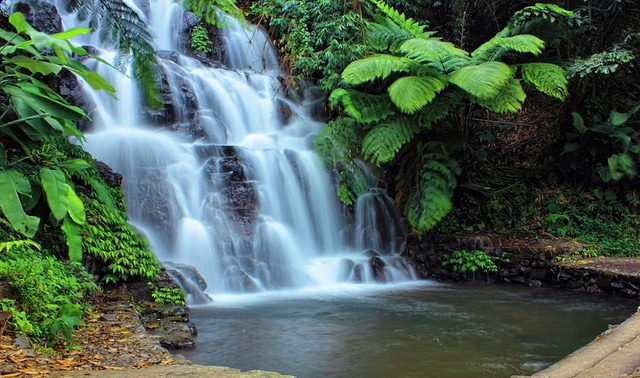 Situated within a chocolate plantation and surrounded by exotic trees, this waterfall is perfect for capturing uniquely romantic photographs. Unlike the loud rumble of many other Balinese waterfalls, here you will be treated to a more peaceful flowing and trickling sound. The perfect backdrop against which you can soak in the natural beauty of this mystical place – it’s no wonder they say spiritual healings are known to happen here! No list of what to do on your honeymoon in Bali would be complete without a day at one of the most luxury spas on the island. Everyone deserves a little relaxation time – after all, even newlyweds need a bit of pampering! 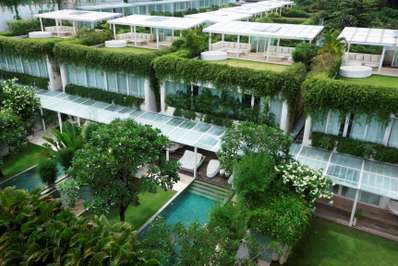 In Seminyak, The Prana Spa is just the place. Known for warm professionalism and a relaxing atmosphere, the massages here are second to none. One of the largest in Bali, whether you are after a quick facial or a full body massage, you are sure to leave having experienced total bliss. Featuring the exotic influence of Indian & Middle Eastern architecture, the treatment rooms are havens of peace and perfect tranquillity. You simply can’t miss it! If you also feel like trying some authentic Bali yoga, head to Canggu and spend a day with Samadi Yoga. You won’t regret this decision! What better way spend your evening than watching the sun drift below the horizon with your favorite cocktail in hand? 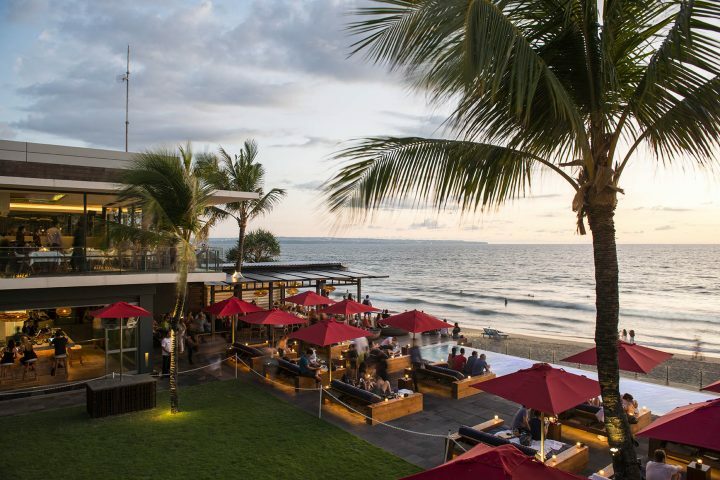 Ku De Ta is the perfect luxurious beachfront venue for drinks with a view. A restaurant, bar and beach lounge with a soulful soundtrack and panoramic views, Ku De Ta oozes elegance and boasts great service. Unlike some bars in Seminyak, you will find delicious cocktails which don’t skimp on quality. A popular place to chill out with groovy vibes and an irresistible food menu, it is worth booking ahead to avoid disappointment! For nature-loving couples wondering what to do on your honeymoon in Bali, the chance to release baby turtles back into the wild will be a unique experience that you are sure to reminisce about! It is well-worth spending an hour or two at the Turtle Conservation and Education Centre with passionate volunteers, who give up their lives to help conserve these endangered critters. An opportunity to give back to nature on the beautiful island of Bali, you can ‘adopt’ and release a baby turtle back into the ocean. For something fun, educational and a little different look no further! Imagine an infinity pool with emerald green water, carved out between the rocks by nature herself and overlooking a stunning ocean vista: meet the Angel’s Billabong. Located in Nusa Penida, this hidden gem has become more popular but arrive early enough and you can still have the place to yourself. A spectacular natural marvel, a quick dip in this picturesque infinity pool is undoubtedly one of the most romantic things to do in Bali. Lying just around the corner is Broken Beach, which boasts of similarly spectacular views, sure to amaze anyone flicking through your honeymoon scrapbook for years to come. Be sure to bring appropriate footwear as the rocks can be slippery – and don’t forget your camera! For one of the more unique honeymoon activities in Bali, the chance to explore magical coral reefs is a dream come true. Don’t be put off if you haven’t scuba-dived before – you’ll soon get up to speed! Adventure Scuba Diving Bali is a smaller dive company with a lot of personality and offers the perfect introduction to the underwater world. The surrounding coral reefs offer many options, all of which are teeming with life – from beautiful shoals and unusual lionfish to secret shipwrecks and underwater Buddha’s, there is almost no end to the things you can see! A honeymoon in Bali is sure to have you feeling on top of the world, but a visit to the Giant Swing at Puncak Danau Buyan Wanagiri will show you the view from up there. A hidden gem surrounded by breath-taking panoramic views, this is possibly the most scenic place on the island! An incredibly picturesque viewpoint which is still all-but-unknown to the world of tourism, there are countless unique photo opportunities for happy couples here. The swing itself promises to be an exhilarating experience, dangling whimsically over Lake Buyan and the surrounding forest. A must-visit for couples looking to find the path less beaten! What honeymoon would be complete without a romantic meal by the beach? It’s one of the most romantic things to do in Bali. One of our favourite spots is La Laguna in Canggu – a bohemian, gipsy-inspired, Alice-in-Wonderland-esque restaurant on the sand. The fantastical decor and style make for a unique alfresco dining experience and the delicious menu will not disappoint! For an enchanting hippy vibe featuring gipsy caravans, picturesque sunsets and tranquillity, it is hard to imagine a better place! La Laguna is an unmissable restaurant for newlyweds in Bali. Lovers of quiet, exotic shores need look no further than Green Bowl, a hidden gem on the southern coast of Bali. Whilst the descent down the cliff face requires a few hundred stairs, it is well worth it to find this relatively well-kept secret and the panoramic views on the way are sure to keep you going! The origin of the name Green Bowl remains a mystery, with some suggesting it is inspired by the view of the green corals exposed at low tide. What can be certain is that the golden sands and turquoise waters are sure to appease any happy couples – perfect for getting away from the hustle and bustle of the town. A word of advice – be sure to have your taxi driver wait for you, as the beach is a 45-minute drive from Seminyak! Bluebird Taxis are a reliable choice. 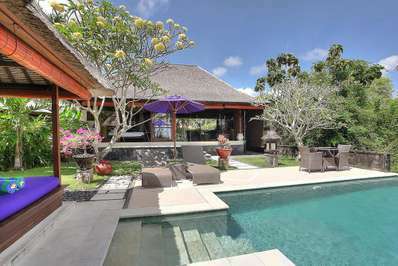 It’s a staple on every list of what to do on your honeymoon in Bali – stay in the perfect luxury villa! There are plenty to choose from. 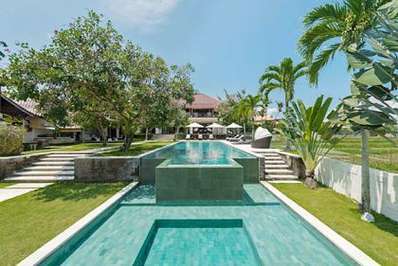 How about Villa Solo, located in Seminyak – a district famed for sweeping sandy beaches, world-class restaurants and trendy bars. 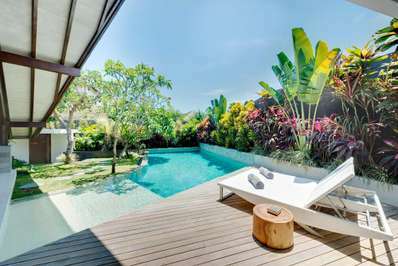 Set within an enchanting courtyard which overflows with tropical plants, this one bedroom villa boasts contemporary Balinese design and a pristine swimming pool. Professional yet discreet staff will guarantee that you are pampered throughout your stay! Villa Radha is another of our favourite one-bedroom honeymoon retreats. A haven of blissful privacy featuring a lagoon-style plunge pool, this retreat has a unique 100-year history with eclectic furnishings and artefacts. Combined with the contemporary luxuries of a regal king-sized bed, a walk-in rain shower and a magnificent al-fresco two-person bathtub, staying here will be one of the most romantic things to do in Bali. Need more reasons to choose Bali for your perfect honeymoon? Check out our five day Bali itinerary for some restaurants, activities and villas to inspire you!